Make a day of it with our pub and hotel recommendations at these top bluebell woods and snowdrop gardens. Go now and you’ll get the chance to walk along Cliveden’s Snowdrop Trail, where a swathe of the pretty white flowers blankets the garden floor. 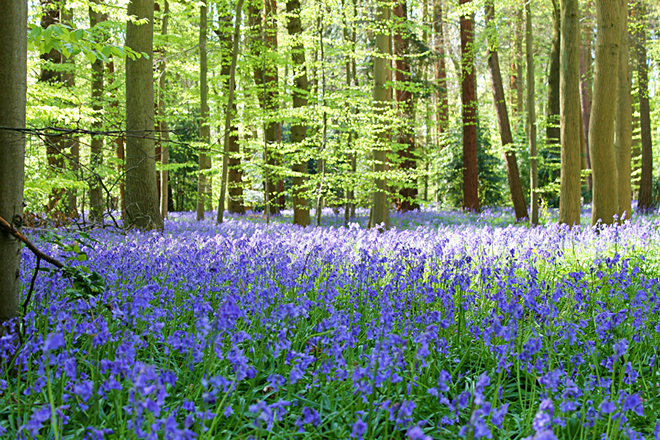 Come in April or May, though, and you’re in for an even more colourful treat: bluebell woods. There’s a self-guided trail to take in the best bluebell displays, and you can round off a day among nature in Cliveden House’s Orangery cafe. Make it a weekend: Stay at 4-star country inn The Bel & The Dragon in Cookham for a luxurious weekend among nature, and dine in their delightful gastropub downstairs for a warming winter feast. No need to hibernate this winter – Dunham Massey have a colourful winter garden with flowering snowdrops, cyclamen and blue winter irises. Plus, in spring, bluebells coat the meadows around the estate. Plus, there are ancient trees, a 400-year-old mill and herds of Dunham deer roaming the park grounds. Make it a weekend: Spend the night nearby at The Black Swan, where boutique-style rooms have statement wallpaper and the restaurant downstairs serves sublime, home-cooked meals. February sees a snowdrops festival at the former home of Jane Austen’s brother, now run by the National Trust. Chawton House’s Snowdrop Sunday falls on 17 February (11am-4.30pm), when hundreds of the flowers will form a carpet of white across the lawns. There’s a pretty walled garden on the grounds, and a tearoom where cakes and coffee will warm you up after a day outside. Make it a weekend: Stay at The Swan, an 18th-century coaching inn with a fine-dining restaurant attached. During February, the ancient parkland surrounding Ankerwycke Yew tree at Runnymede comes alive with a spectacular show of snowdrops. The National Trust will be running 90-minute guided snowdrop walks at 11am on Sunday 10 and 17 February. Over 1,000 years old, Ankerwycke Yew witnessed the signing of the Magna Carta and is supposedly where King Henry VIII met Anne Boleyn. Make it a weekend: Stay at spa hotel The Runnymede on Thames. You’ll be a stone’s throw from the natural action, and have the opportunity for a post-walk soak in the outdoor hot tubs. Whether you want carpets of snowdrops or bluebell woods, Calke Abbey is the place to go. Winter sees snowdrops brighten up the landscape here, with bluebells replacing them as the weather warms up. Explore the Abbey’s Orangery or enjoy a winter walk through the estate. Make it a weekend: Stay at Abbots Oak Manor, a country house hotel with a grand staircase and sumptuous rooms. Eat at the nearby Grey Lady – a beautiful upscale restaurant using local ingredients. Head to the wild botanic garden of Wakehurst to see snowdrops form huge drifts as you walk from the Visitor Centre and around the trees near the Mansion Pond. There’s a new winter garden opening here on 23 January, too, so there will be plenty more plants to see. Volunteer guides will lead tours through the gardens daily at 11.30am to explain the plants and trees in season as well as the history of the estate. Make it a weekend: Stay at Gravetye Manor, just a 10-minute drive away. There are more spectacular landscaped gardens to explore, plus an unmissable Michelin-starred restaurant. 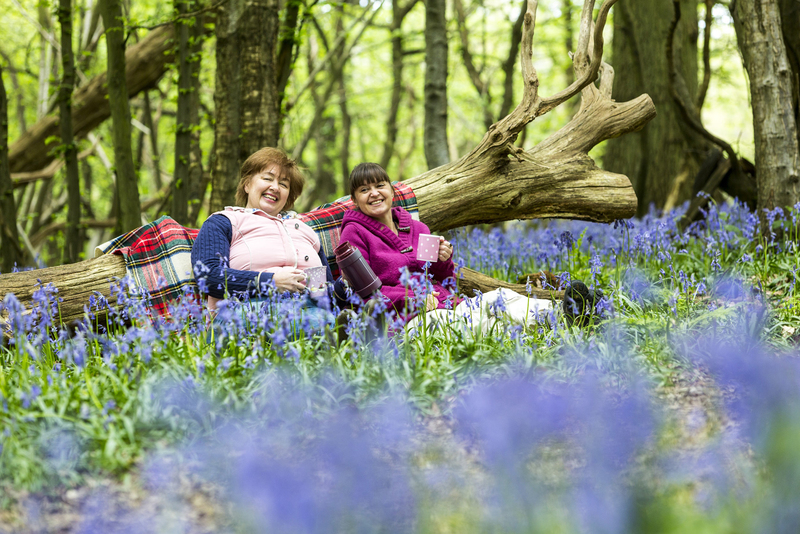 Ancient woodland and open grassland make for a wonderful day out in nature at Hucking Estate, where the bluebells come out in force in spring. A designated Area of Outstanding Natural Beauty, there are achaeological remains, wonderful walks and birds such as partridge and skylarks to spot. Make it a weekend: Stay at the nearby Stable Courtyard within the grounds of Leeds Castle, and eat out at the cosy Hook & Hatchet.